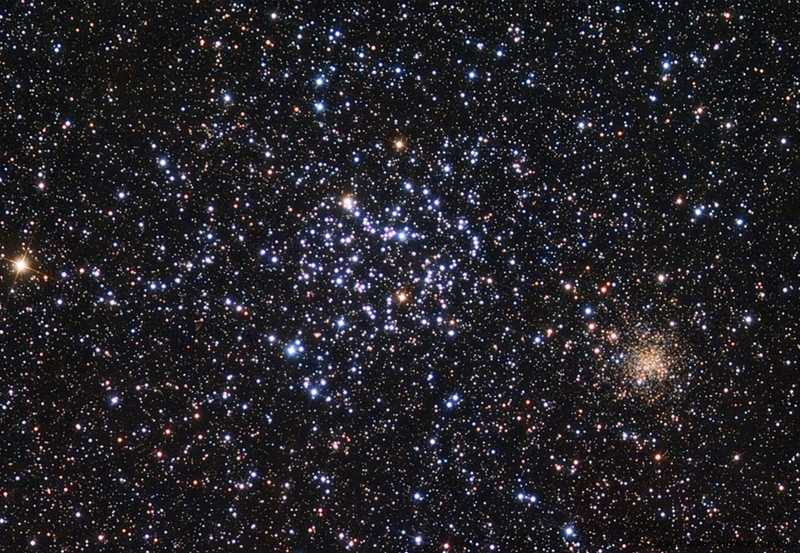 Our deep-sky objects for March 2011 are a pair of open clusters that sit nicely in the field of view of most imaging setups – these are M35 and close-by NGC 2158 in Gemini. M35 (also labelled NGC 2168) has a diameter of 25′ and shines at magnitude 5.1 at a distance of 2,800 light years. Nearby NGC 2158 looks a lot smaller at only 5′ across, but that’s due to NGC 2158 lying 6 times further away than M35. The main stars of M35 are distinctively blue, while the stars making up NGC 2158 are clearly old and red. This colour combination makes for a great deep-sky image if you can get both objects in the FOV. In oder to pull out faint little NGC 2158 it is probably best to go for slightly longer sub-exposure times, I would try for at least 5-minute subs at f#3.5, and again go for at least 50-subs in total – an imaging time in excess of 4-hours is therefore required. Until next month – clear skies to you all!